Around the end of the 19th century there was a popular playground skipping-rope rhyme. This refers to a double murder and a trial that gained extensive media coverage across the US. Andrew Borden and his wife Abby were horrifically killed, Andrew having been struck 10 or 11 times with a hatchet-like weapon and Abby’s skull was crushed by 19 blows. Police found a hatchet in the basement which, though free of blood, was missing most of its handle. Andrew had two daughters, Emma and Lizzie. Abby was their step mother, the real mother died when the girls were 11 and 2 respectively. Andrew was a rich and successful property developer. During the inquest, the Bordens’ live-in maid testified that Lizzie and Emma rarely ate meals with their parents. Lizzie stated that she called her stepmother “Mrs. Borden” and demurred on whether they had a cordial relationship. In May 1892 Andrew, believing that pigeons Lizzie kept in the barn were attracting intruders, killed them with a hatchet. A family argument in July 1892 prompted both sisters to take extended “vacations”. Tension had been growing in the family in the months before the murders, especially over Andrew’s gifts to various branches of the family. After Abby’s relatives received a house, the sisters demanded and received a rental property—which they later sold back to their father for cash and just before the murders a brother of Andrew’s first wife had visited regarding transfer of another property. The night before the murders, the brother of Lizzie’s and Emma’s deceased mother, visited the home to discuss business matters with Andrew. Some writers have speculated that their conversation, particularly about property transfer, may have aggravated an already tense situation. For several days before the murders, the entire household had been violently ill. The family doctor blamed food left on the stove for use in meals over several days, but Abby had feared poisoning, as Andrew Borden had not been a popular man. Lizzie was arrested within a week and indicted by the end of the year. Both Lizzie and Emma had a religious upbringing. Lizzie was very involved in church activities including teaching Sunday school to children of recent immigrants to America. The family’s respectability added another level of intrigue to the trial which was widely followed in the media. The hatchet head found in the basement was not convincingly shown to be the murder weapon. Prosecutors argued that the killer had removed the handle because it was bloody, but while one officer testified that a hatchet handle was found near the hatchet head, another officer contradicted this. Though no bloody clothing was found, a few days after the murder Lizzie burned a dress in the stove, saying it had been ruined when she brushed against fresh paint. There was a similar axe murder nearby shortly before the trial, though its perpetrator was shown to have been out of the country when the Bordens were killed. Evidence was excluded that Lizzie had sought to purchase prussic acid (for cleaning a sealskin cloak, she said) from a local druggist on the day before the murders. Because of the mysterious illness that had struck the household before the murders, the family’s milk and Andrew and Abby’s stomachs (removed during autopsies performed in the Borden dining room), were tested for poison and none was found. The victims’ heads were removed during autopsy. When the skulls were used as evidence during the trial Lizzie fainted. In June 1893, Lizzie Borden was acquitted. No-one else was charged with the murders. Emma and Lizzie inherited their father’s estate and continued to live together in the house for another 12 years. Lizzie herself, despite her acquittal—one theory being that she killed her parents while in a fugue state. A “William Borden” (who was Andrew Borden’s illegitimate son) after failing to extort money from his father. Emma Borden, having established an alibi at Fairhaven, about 15 miles away returns to commit the murders and then goes back again. What would an astrological whodunnit reveal ? Its fairly safe to discount both the maid and William as they did not stand to benefit from any inheritance. We also don’t have any birth data for them. There is also no birth data for Andrew or Abby the victims, which is a shame as it would be interesting to do a complete family synastry match up. We do have the charts for Lizzie and Emma so perhaps we can have a look to see who might be the most likely of the two to commit such a deed. 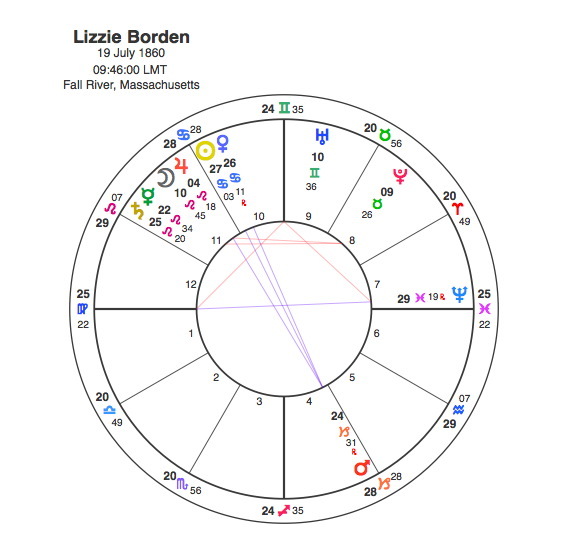 Lizzie Borden has the Sun in Cancer, already a very interesting starting place given that her whole life revolves so powerfully around the theme of family and relationships with one’s parents both areas ruled by this sign. She has the Sun in conjunction with both Venus and Jupiter which is hardly the kind of thing you’d expect from someone who murdered their parents but it is from someone who benefitted greatly by inheritance. Lizzie’s Sun is opposite Mars in Capricorn in the 4th house. The Sun’s opposition to Mars is a surprisingly rare aspect and it does indicate a significantly violent incident involving her parents ( Cancer to 4th house ). The Moon is conjunct Jupiter in Leo and this combined with the Sun’s position really just gives us a picture of a respectable lady who comes into great benefits as a result of an act of violence or an accident to her parents. The Moon however, is square to Pluto in the 8th house which really does point to the sudden death of her father and mother with a suspicion that she might have been somewhat involved with it. It has to be said though that her loss of her mother at the age of two and her father and stepmother could easily be enough to explain this aspect. Neptune’s position opposite the Ascendant is intriguing but is perfectly explained by Lizzie’s having a lesbian affair during her 40s. Neptune is in the 7th house of relationships and in this place there is often an experimental approach to affairs of the heart together with a blurring of the boundaries that society might expect. The striking thing about Emma’s chart is the conjunction of the Sun, Moon and Neptune in Pisces at the base of her chart. It would be hard to imagine a chart more Piscean than that and on the typical astrological interpretation of this placing, equally hard to believe her capable of murdering her parents. Pisceans are after all the most sensitive, compassionate and empathic individuals. Pisceans are also very fluid, changing characters and are notoriously difficult to pin down. Its the hardest sign for an astrologer to interpret because, as the last one of the Zodiac coupled with their impressionable sponge like nature, they can contain the experiences of all the other signs. If read in one way, this conjunction around the 4th house cusp can simply show the mysterious removal ( Neptune ) of both her father ( Sun ) and mother ( Moon ). On the other hand, Neptune has a strong connection with deception and the creation of illusions. Pisces also has a reputation for secrecy and an ability to evade responsibilities. If the Sun / Moon / Neptune conjunction appeared in the chart of a saint it would be no surprise. If could equally appear in the chart of a conjuror or a con man, however. There does not seem to be any references to Emma Borden’s saint like status either before or after her parents murder so we can discount this one. It is 4th house and Sun and Moon so we are looking the simple loss of her parents or deception around the circumstances of their death. Another factor to take into account is that Scorpio is rising. The Ascendant rules the image presented and with Scorpio there’s always a lot more going on than meets the eye, so secret plans and motivations are a definite possibility. One interesting pattern in Emma’s chart is a T square made up of an opposition between a difficult Saturn / Uranus / Pluto conjunction and Jupiter which focuses onto an apex Venus in Capricorn. Venus is the principle of attraction, it governs our capacity to relate to others. In Capricorn it can be rather cold and hard hearted with an overemphasis on the material rather than the emotional particularly when the aspects are difficult. In the research into Serial Killers it is noted that square aspects occur much more frequently than in the charts of anyone else and this is particularly true of the square aspects to Venus. Looking at astrological precedents may be of limited help as people who murder their parents are not as common as serial and other killers and Capricorn Research only has 38 charts in this category so the sample is too small to make any clear conclusions. It maybe relevant that the most common Sun and Moon signs in this group are Taurus and the least common are Emma’s pairing, Pisces. Sun / Neptune aspects do occur more frequently than expected although this is more the case with the opposition than Emma’s conjunction. Neptune plays another part in that it occurs 3 times more than expected in opposition to the Ascendant as it does in Lizzie’s chart. Another similar score is for the conjunction of Mercury and Saturn which Lizzie also has. Like the serial killers, parent killers also have a large number of squares involving both Venus and Mars and Emma’s Venus / Saturn square scores highly. These precedents do reveal a few interesting pointers but nothing that really points at one of the sisters rather than the other. There is one contact between their two charts that is very powerful. Emma’s T Square falls on Lizzie’s Sun / Mars opposition so the most difficult patterns in both charts come together. This is not surprising given their shared fate but we will come back to this connection after we have looked at transits. For an event like this we should expect seriously heavy transits. Lizzie Borden had no Pluto transits for 1892, the most significant that she had that year was Saturn conjunct her Ascendant around the time of the murders. Saturn has a 29 – 30 year cycle and its interesting to note that this occurred previously in 1862-3 when Lizzie’s real mother died when she was two years old. In fact this was a serious turning point for Lizzie indicated by the fact that Pluto was in exact square to her moon at this point. Lizzie also has the transiting Jupiter in her 8th house in square to Mars in 1892 and square to the Sun and Moon in 1893. These transits of Saturn and Jupiter have probably more to say about what happened to Lizzie after the murders. Saturn conjunct her Ascendant could easily fit with her being held in custody awaiting her trial and Jupiter square to the Sun and Moon is likely to result in her acquittal. They are interesting transits that seem to fit the events but nothing that suggests she actually committed the murders. Emma’s transits are a different matter altogether. In 1892 Pluto and Neptune were in close conjunction. This powerful conjunction made no contact with anything in Lizzie’s chart but they were both in square to Emma’s Sun. This is without doubt the strongest transit of her life. In the chart of a murderer a Pluto / Sun transit is likely to be the thing that triggers the event but in this case we have Neptune as well. Its important to remind readers that Neptune in Emma’s natal chart is conjunct the Sun and Moon on the 4th house cusp. Looking at the charts of the two sisters, its not a simple task to see murder in either of them and the difficult aspects in each may simply explain the loss of their real mother and father and stepmother. The transits however can be seen to suggest something else. Neptune’s square to Emma’s Sun / Moon / Neptune in the 4th seems to be suggesting that mysterious circumstances that include deception and illusion are involved. The biography “Lizzie,” by Frank Spiering, concludes that Emma drove home in her carriage early in the morning and committed the murder. This would indicate a level of both premeditated calculation together with secrecy and deception that was certainly not considered by the police. But then the police didn’t have charts of the two sisters to consider as evidence. It may not be accepted in a court of law but if we make an assumption that it was in fact Emma that committed the murders, her chart can certainly be read in a way that would back this up. It would explain the clever use of an alibi of being away at the time and it would particularly point to the timing. The Neptune / Pisces capacity for deception would be a key issue and the difficult T Square to Venus in Capricorn which show the capacity to carry out such a deed. 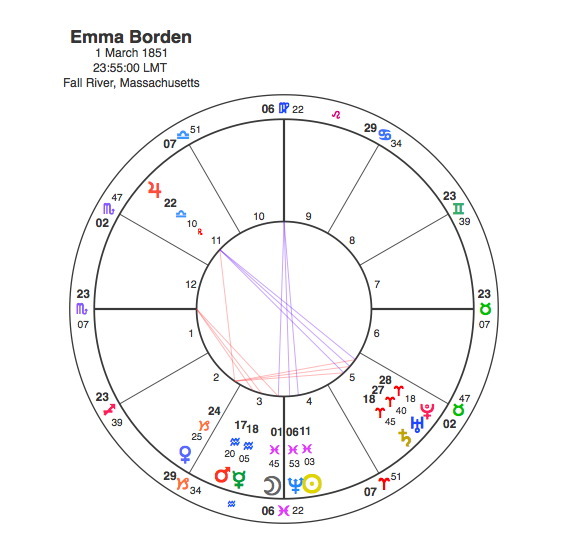 If anything in a chart promotes forceful and significant action it is a planet that is the apex of a T Square and Emma’s Venus together with the nature of the Saturn / Uranus / Pluto conjunction involved does seem to point the finger at her. If we look at things from this direction we can see that as Lizzie’s Sun is opposite Emma’s apex Venus, Lizzie draws attention away from Emma for the murders. This may be a rather bizarre interpretation of events particularly in light of the fact that Lizzie and Emma continued to live together for another 12 years. How could Emma have done that if she had killed her parents and arranged things in such a way that there was a very strong chance of her sister being found guilty ? To do that would require a very powerful self control and ability to live a lie. But she did have Scorpio rising and the Sun / Moon and Neptune conjunct in Pisces. A fascinating site. I’ve studied astrology for 20+ years. I can give you my chart and list some major life events (triggered by Pluto transits) to add to your research.